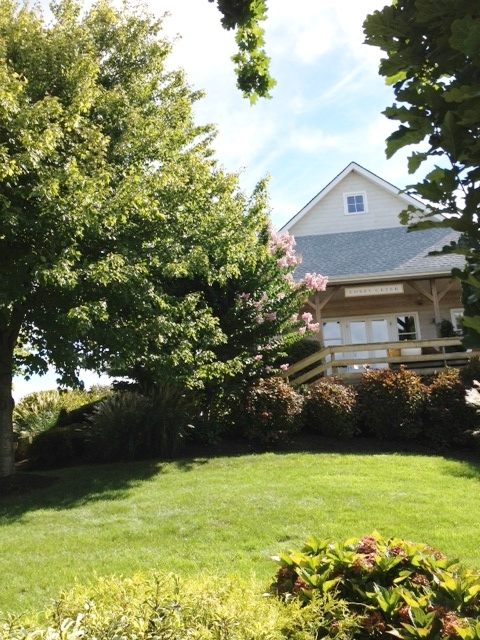 The tasting room sits on a rise overlooking the vineyard. 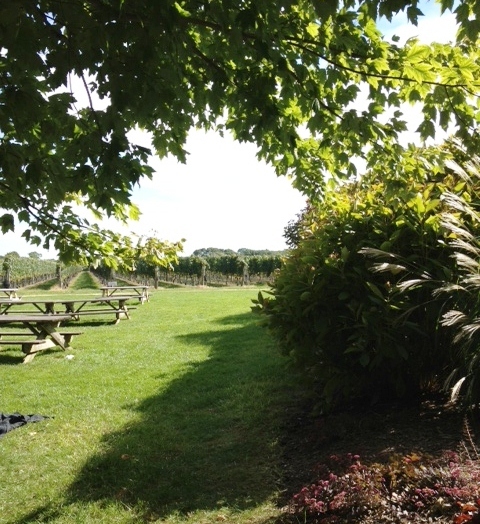 We had the room to ourselves on a bright and sunny but slightly chilly September afternoon, except for some children whose parents were picnicking outside, and who came running in to use the rest room. 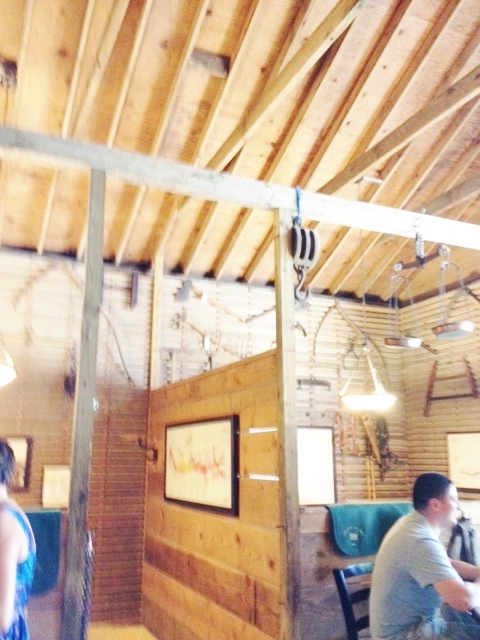 The two servers were friendly and chatty and quite well-informed, and we spent a pleasant time with them. 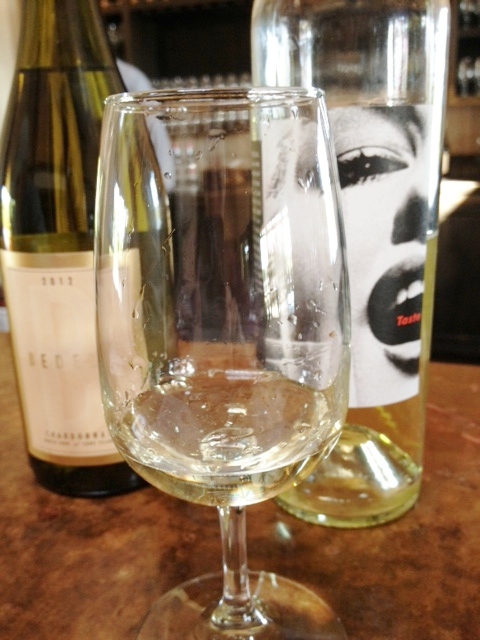 Corey Creek offers two tastings, plus wines by the glass or bottle. The Estate tasting includes 5 wines for $12, and the Premium has 5 wines for $15. Somewhat disappointingly for those looking to try a variety of wines, several of the wines are the same on each list. However, our server had a good idea, and, since she had a bottle open anyway, gave us a taste of a different wine instead of one of the overlapping ones. I’ve marked the wines which were only on the Premium tasting with an * so you can decide whether you want to invest the extra $3 to try them or not. I would stick to the Estate tasting next time. Both tastings include this wine, Corey Creek’s only offering of its own wine, as I noted above. This has a bit of that cat pee smell Gewürztraminers sometimes have. The taste is quite bracing, with lots of lime and tangelo, and is rather acid at the end. Not a sweet Gewürztraminer! It is good, though I like One Woman’s version better. Note the snazzy bottle on the right. This is, our server informs us, a blend of Chardonnay grapes from six separate plots, and is fermented half in oak and half in steel, so it avoids being either overly oaky or overly simple. This has some nice tropical fruit flavors and the usual vanilla scent of oaked chards, but is not very complex. I really like the label of this one, as it has an interesting image which reminds me of Marilyn Monroe. This is a blend of 40% Sauvignon Blanc, 32% Viognier, 22% Chardonnay, 5% Gewürztraminer and 1% Riesling, and I enjoy sipping it. It is nice and light, and would make a great summer aperitif, with some lemon-lime flavors that would complement seafood very nicely. Again, both tastings get this wine, a blend of Merlot, Cabernet Franc, Cabernet Sauvignon, and Syrah. With that information, you would expect this to be a rather complex rosé, but in fact it is just okay, and once again does not measure up to the Croteaux rosés, our gold standard for the North Fork. It is, however, a perfectly fine rosé, with the typical strawberry aroma and tastes of papaya and peach. You won’t find this on the menu, but noting our seriousness of demeanor and my careful note-taking, our server offers us this addition to our tasting. As she says, this would make a great aperitif, and, as my husband notes, you could easily quaff a lot of this “and then fall over.” It would be lovely with a strawberry floated in it, as it is relatively dry. This is a “tank fermented” sparkler, but they also make a Méthode Champenoise sparkling wine, using the facilities at Sparkling Point. Now we switch to reds. I’m thinking of picnics and roast chicken and a slightly chilled Beaujolais Nouveau as we discuss this wine. It is fairly mellow, soft, and not very assertive, and would be good with a simple dinner. Quite buyable. Both tastings include this, my favorite so far, with lots of layers of taste, including blackberry. Again, it is dry, but not too dry, and very pleasant to drink. Rather than give both of us the Cab Franc, the server cleverly gives my husband this Merlot instead so we can try a different wine. This is a fairly typical NoFo Merlot, with nice black cherry tastes and a short finish. Lighter than I expect for a Malbec, this has lovely tastes of boysenberry, with some hints of cocoa. Very good, though a bit pricey for how I would rate it. 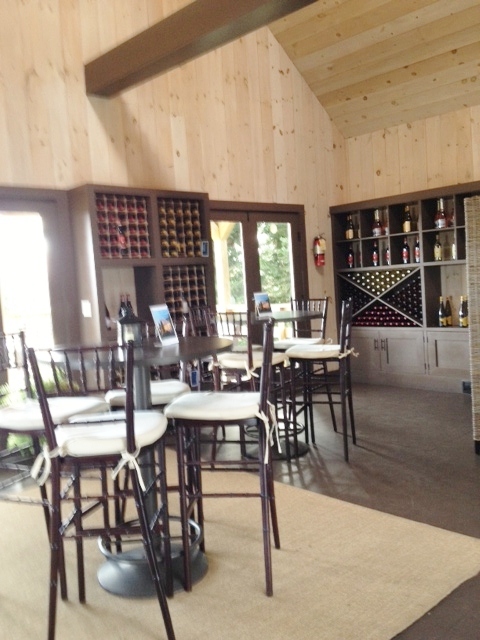 A view inside the tasting room. 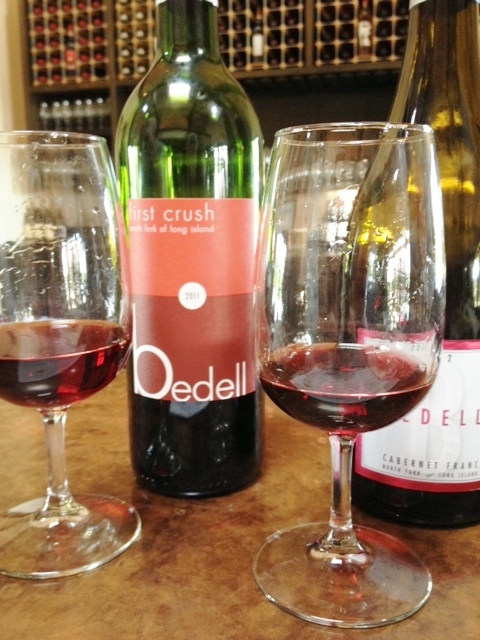 Reasons to visit: Quiet rustic tasting room (buses, etc., by appointment); Bedell wines plus their own, so a good place to come if Bedell is crowded; the First Crush Red and the Taste White. 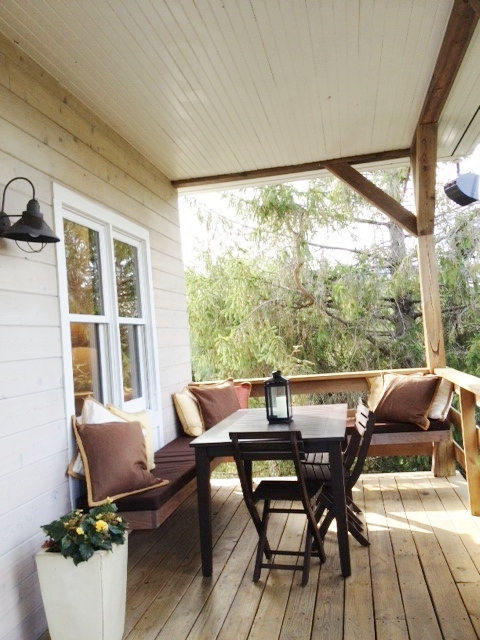 We could have had our tasting on this pretty porch. Friends often ask me, “What’s the best vineyard on the North Fork?” My general answer is, “It depends on what you like.” However, probably the best all-around vineyard is Pellegrini, for several reasons. It is large enough so that if you go with a group you will be able to find a table where you can all sit together. It is small enough so that you can stand at the bar and have a good conversation about the wines with the servers. Both the whites and the reds are good, though we tend to prefer their reds, which we feel are better than the general run of reds. It does lack the somewhat frenetic party atmosphere of some places, however, and they tend to focus on the wines rather than agritainment. 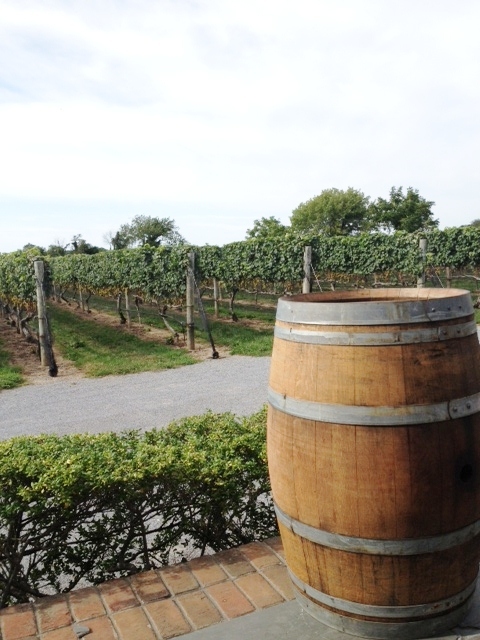 Oh, and many of the wines are reasonably priced for the North Fork. Pellegrini is also good for a group because if you like you can mark your selections on a clearly laid out menu that is also a map telling you in what order to drink the wines (top to bottom, left to right) and take the tray to a table outside overlooking the vineyards, which we did. One of the friends in our group of eight had brought along bread and cheese and hummus, so we had a lovely afternoon tasting, laughing, and snacking. The tasting menu has a variety of options. The Bar Tasting is $6 and gives you three one-ounce pours which you can choose from a menu of ten wines to be drunk at the bar. 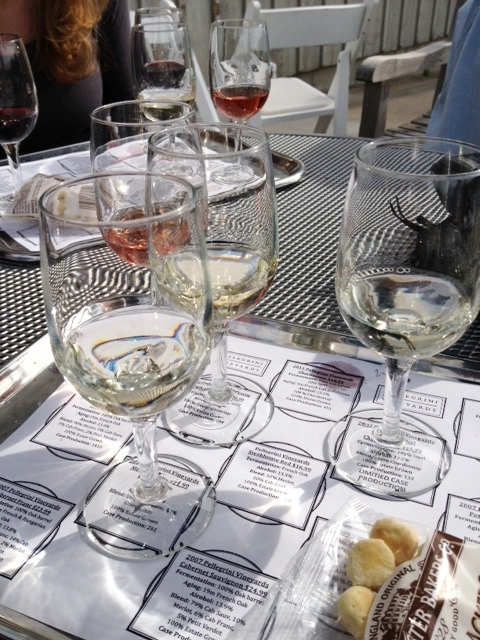 The Flight Tasting is $12, and gives you three two-ounce pours, plus a one-ounce “complimentary” pour of their rosé, chosen from 13 options, which you then take to a table. There’s also a Vintner’s Flight for $14, four one-ounce pours of higher-priced wines, and a Wine and Chocolate Flight for $16 for four reds plus chocolates. As wine club members, we were entitled to four free Flight tastings, which worked perfectly, since all the couples were happy to share. Since we belong to the only-red-wine category of the club, we decided to taste some of their whites. Amongst the group, we tried quite a few wines, so I’ll be adding in some notes from other people as well. A tray of whites, with one rose. This is the “complimentary” taste, a steel-fermented blend of Merlot, Cabernet Franc, and Cabernet Sauvignon. As usual, we compared it to Croteaux’s rosés, and it is good, but not as good. It has lots of the strawberry aroma and taste one expects in a rosé, but not much else. Our friend characterized it as a “meet and greet” wine, nice to have at a barbeque on a sunny day. I detect some of that cat pee smell which Gewürztraminer often has. We taste honey, but it is not too sweet, with some nice fruity notes. Nice crisp apple taste, but a bit too sweet is the word on this one. We still prefer the Channing Daughters Scuttlehole Chardonnay. Another steel-fermented wine, this one is a blend of 59% Sauvignon Blanc and 41% Chardonnay. I get a mineral aroma, perhaps of wet rock. It tastes fine, however, with a balance of sweet and acid, with perhaps too much sourness at the end. 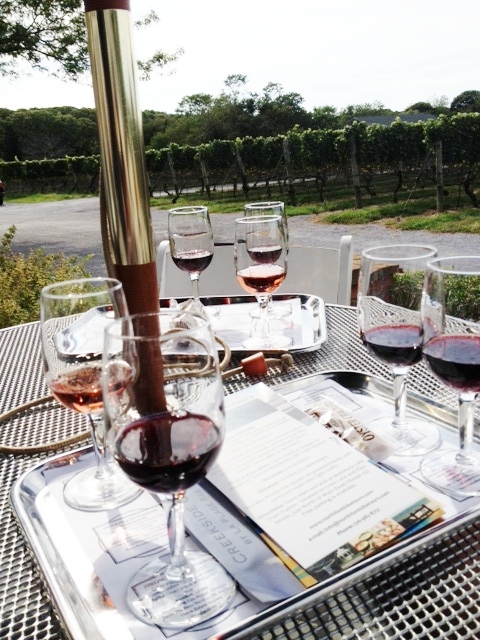 Some red tastings plus a view of the vineyard. As I’ve said, we like their reds, and this, as Rod Serling used to say, is a case in point. A blend of 93% Petit Verdot, 6$ Merlot, and 1% Cabernet Sauvignon, aged in French oak for 20 months, this is a lovely wine, and the favorite of the group. 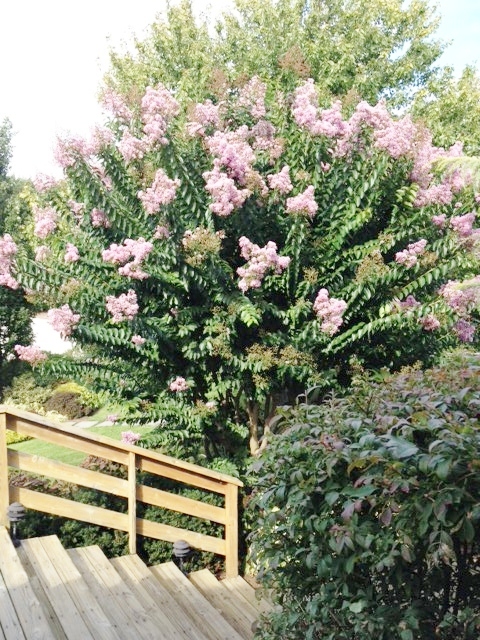 It is somewhat earthy and leathery, but quite richly fruited. My friend sniffs and says, “Coffee, chocolate, pepper!” Those elements are in the taste as well, plus lots of cherry. She’d like it with pizza which, since she makes her own, is high praise. This one, according to the group, is a bit too acidic to drink on its own, but would be good with food. Nice berry flavors with some peppery notes at the end. Another blend, this one is 60% Merlot, 25% Cabernet Sauvignon, and 15% Petit Verdot. Light and fruity, everyone says, and dry, with basically no finish. 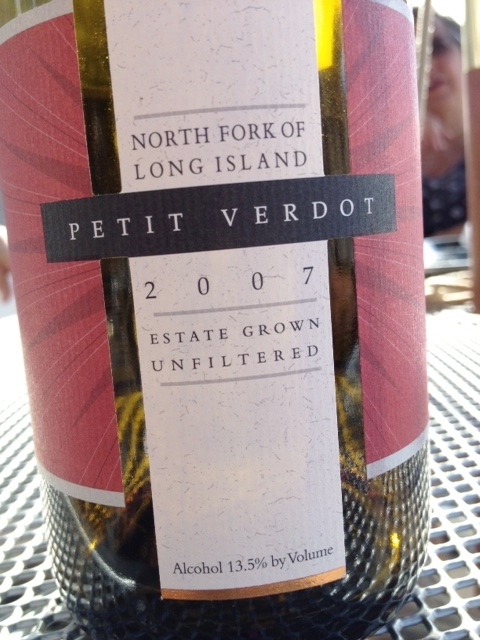 After the tastes, one friend buys a bottle of the Petit Verdot, which we happily share as we munch on Catapano Farms goat cheese and enjoy the cool and sunny late summer afternoon. Reasons to visit: good all-around winery, good reds, pleasant atmosphere, good for a group or for just a couple, the Petit Verdot. After an excursion to Westhampton Beach for an art show, and a visit to a friend’s house for a smaller art show, it was time for a different type of art, so off we went to McCall’s Winery. Mr. McCall does treat wine-making as an art, concentrating for the most part on producing some of the best reds around, with only a few whites. He and Mrs. McCall were both on hand, which was fortunate, as there was quite a crowd, including at least one bachelorette party (we could tell by the white veil on her head…). As Mr. McCall had told us on an earlier (much less crowded) visit, he used to be a Coca-Cola distributor, but then became interested in wine making. In addition to his vines, he also tends a herd of grass-fed cattle one can see munching said grass in a field next to the winery, and whose meat can sometimes be bought at Love Lane Market. 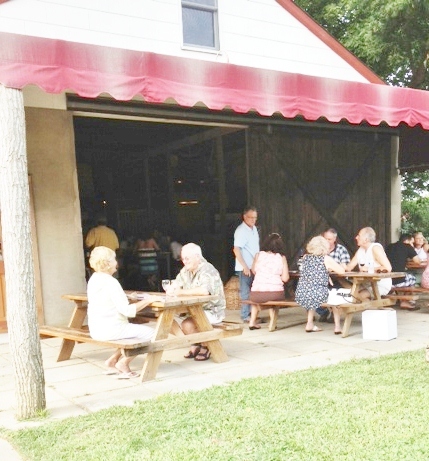 I described the tasting room, in a repurposed stable, in an earlier entry, and most people are out on the grass at picnic tables. 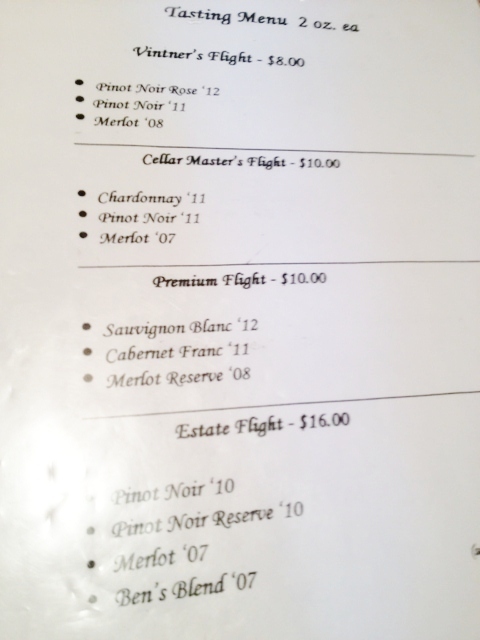 The tasting menu now offers four levels of flights: Vintner, at three two-ounce tastes for $8; Cellar Master, with three for $10; Premium, at three tastes for $10; and Estate, at four for $16. We decide to share two flights, the Premium and the Estate. Mrs. McCall is serving us, and she carefully monitors the order of our wines, interspersing the two flights for the best path through the tastings. 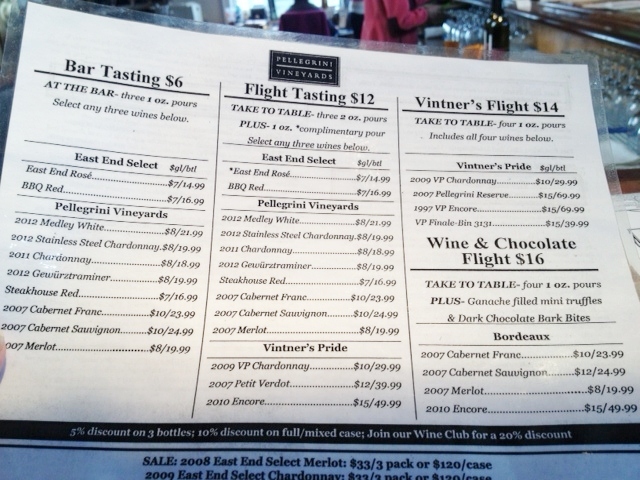 As a result, I have marked the wines from the Estate flight with *. We start with the only white we’ve tasted at this winery, and it is quite pleasant, with aromas of honeysuckle and citrus, and a taste that combines wildflower honey and kumquat, with some minerality. It is somewhat tart. Mrs. M. admits she’s never tasted a kumquat, and we decide this does not taste like the candied ones one gets, but rather like a fresh one. We thought we’d be moving on to the Cab Franc, but Mrs. M. suggests we have this instead, as it is fruitier. And indeed it is. “Mmmm,” we both say. The day before we had bought some lovely purple plums at Briermere (along with the obligatory pie), and there is a flavor here that reminds me of them, plus a hint of cinnamon. Robust, they call it. Yes, indeed. I love doing this—tasting two wines from the same varietal in succession. So interesting. This one was aged an additional six months in French oak, and we overhear Mr. McCall saying that 2010 was the best year for his wines so far. This is really good, and right up there with other high-priced wines in its taste and complexity. 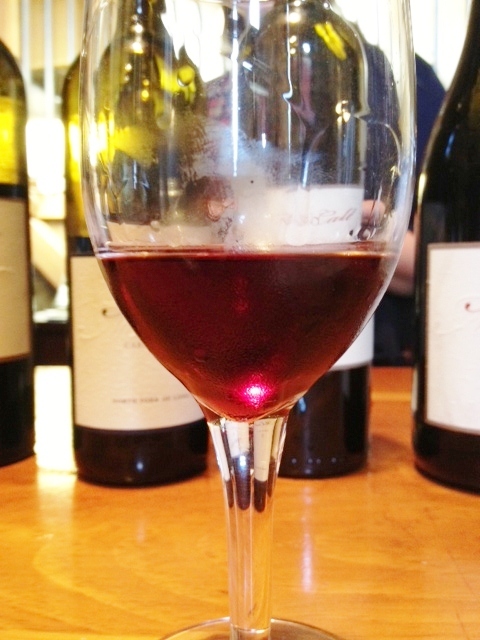 It has much more depth than the other Pinot Noir, with aromas of coffee and chocolate and lots of dark fruit. I bet you could cellar this one. 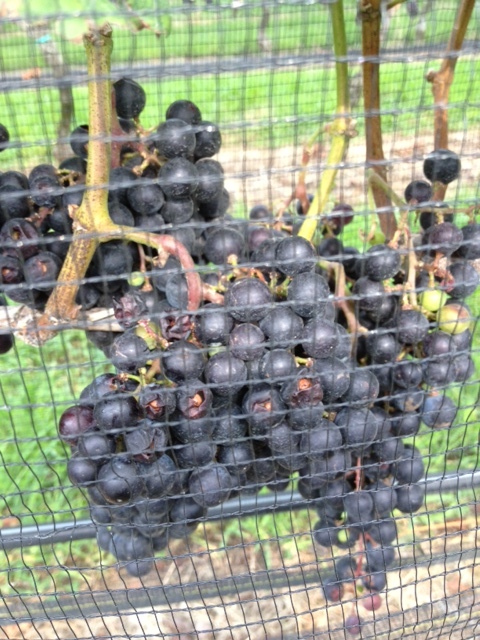 Now we get the Cab Franc, which is our least favorite of the day. We smell a brambley aroma, and some tastes of blackberry, but also a bit of an olive taste, which is somewhat off-putting. Poetically, my husband compares the aroma to the woods at dawn, evoking memories of when we used to go camping, and I would step out of the tent and inhale that dewy scent. As we agreed the last time we were here, this is definitely better than most North Fork Merlots, with very cherry tastes and good tannins and structure. Buyable, though we don’t buy any this time. This Bordeaux blend is named in honor of their winemaker, who sadly passed away. However, this is quite a legacy. The blend is 60% Merlot, 25% Cabernet Franc, 10% Petit Verdot, and 5% Cabernet Sauvignon. We detect scents of cedar and forest, with lots of tastes of berries and plums, plus some chocolate. I could definitely see cellaring this one. Mr. McCall chats with his guests. 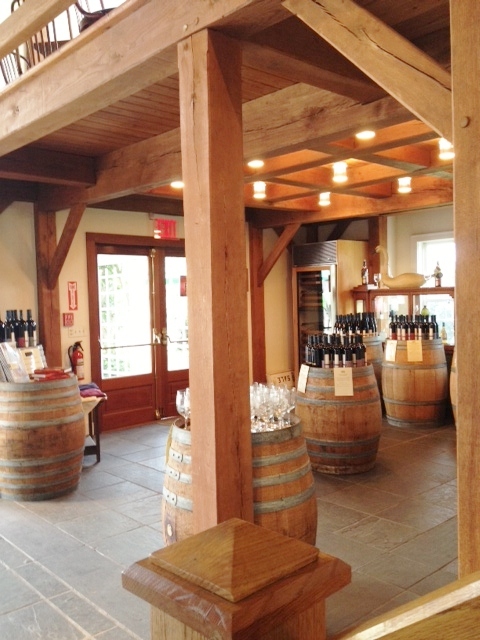 Reasons to visit: some of the best reds on Long Island, the chance to chat with Mr. McCall, who is quite enthusiastic about his wines; Ben’s Blend and the 07 Merlot; a pleasantly rustic setting.